Mitt Romney's VP choice to be announced via app | Android Blast! Mitt Romney will announce his choice for a running mate via a smartphone app. 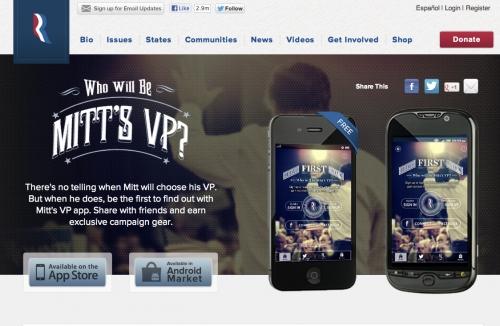 The app promises that users will be notified of Mitt's VP choice even before the press. Of course, all the members of the press will probably download the app to get the news first, but this is certainly an interesting way to announce his choice. In 2008, then candidate Barrack Obama announced his pick of Joe Biden via email. In just four years smartphones have become so much more a part of our lives that this gimmick is appropriate. Mitt's VP is an app that is available for iOS and Android.